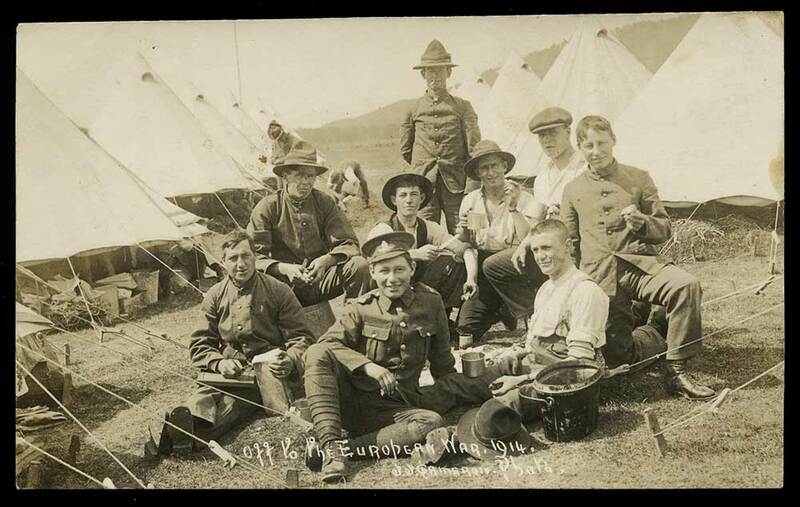 13-24 July 1915 - 24th Casualty Clearing Station, Mudros - enteritis; 11 October 1915 - NZ Field Ambulance, Mudros - catarrhal jaundice; transferred to No 2 Australian General Hospital; 28 October - transferred to England, admitted to King George Hospital; 12 December 1915 - NZ Base Unit, Hornchurch (rejoined unit in Egypt 13 March 1916). Eric was the second son, of four boys and one girl, of Leonard George (1871-1954) and Bella (1876-1956, nee Neill) Scrimshaw. Born in Christchurch, on 4 September 1896, he was later educated at the Temuka Primary School and had attended High School for one year. On leaving school he entered the watch making trade under his grandfather, Mr Neill in Dunedin. Prior to enlisting at Temuka on 20 October 1914, he was working with his father at Temuka as a cabinetmaker, and was a member of the 2nd South Canterbury Regiment. Leonard, his father, operated a cabinet making and undertaking business in King Street, Temuka. Eric was a good all-round athlete and had won prizes for running, swimming and rifle shooting. On his enlistment papers he had put down his date of birth as 4 September 1894, making him two years older than he actually was. Being only 18, he would have been too young for overseas service. His father Leonard was nominated as his next of kin, and he was described as being Presbyterian, single, 5 foot 5 inches tall, weighing 128 pounds (58 kgs), with a chest measuring 32 ¼ to 35 inches, of fair complexion, grey eyes, brown hair, and having good teeth. On 13 July Eric was admitted to the 24th Casualty Clearing Station on Mudros, suffering from enteritis. He rejoined his unit on 24 July. On 3 August he was further mentioned in despatches by Lord Gay for bravery in the field. He was again admitted to the NZ Field Ambulance at Mudros on 11 October suffering from catarrhal jaundice. He was then transferred to No 2 Australian General Hospital and on 28 October, embarked on board the Hospital Ship Aquitania for England, where he was admitted to the King George Hospital. He was then attached to the NZ Base Depot at Hornchurch on 12 December, until returning to Egypt on 1 March 1916, where he rejoined his unit at Ismailia on 13 March 1916. From Alexandria on 6 April 1916, Eric embarked for France. He was promoted to Lance Corporal on 10 June, followed by further promotion to Corporal on 26 December 1916. During this time his unit was involved in all the major battle preparations and many various roles supporting the army advancements in the field. In September 1917 he was detached to England for further training, returning to France to his unit on 28 November. A field promotion to Sergeant followed on 18 May 1918. From 6 August to 12 September he attended the Royal Engineers School at Rouen before being again sent to England on 27 October for further training. Here he attended Officer Training courses and Trinity College at Cambridge, before being promoted to Second Lieutenant on 14 February 1919. Eric finally embarked from Tilbury aboard SS Tofua for his return to New Zealand on 18 April, and was discharged from the army on 26 June 1919. After the war he was absorbed into the strength of the unattached list of officers with the rank of 2nd Lieutenant and transferred to the Canterbury Regiment until 10 October 1927, when he was posted to the retired list. For his 4 years and 250 days service, he was awarded the 1914-1915 Star, British War Medal and Victory Medal. Later in 1967, he was awarded the Gallipoli Badge and medallion. Returning to Temuka, Eric again worked as a cabinetmaker with his father, and took part in many of the town’s activities. Some of these included rifle shooting, football, business men’s association, Repatriation board, Caledonian society, District High School Board, Tekapo Development League, plus many others. On Easter Monday, in April 1922, he married at the Presbyterian Church Temuka, Miss Catherine Bain, the daughter of Mrs Bain of “The Stumps”Farm, Temuka. By 1928 they had moved to the Hamilton district where he was operating as an undertaker, and involved as a member of the Defence League, and member of the Waikato RSA committee. During World War Two Eric enlisted into the Home Guard and was the Captain in charge of A Company, Hamilton Battalion. For this service he was awarded 1939-1945 War Medal and NZ War Service Medal. Eric was elected to the Hamilton Borough Council on 27 May 1944, and was deputy Mayor in 1945, an executive of the NZ Funeral Directors Association, a keen bridge player and jazz enthusiast. In 1935, with his wife, he had moved to 8 Thackery Street Hamilton, where he died on 6 September 1968. He is buried in the RSA Section, Hamilton Park Cemetery, Hamilton. Eric’s brother, 2/1326 Gunner Harry Neill Scrimshaw, also served with the NZ Field Artillery in Egypt, Gallipoli and Western Europe during the First World War. Auckland War Memorial Museum Cenotaph Database [November 2016]; Shera, L M, et al, "Official History of the New Zealand Engineers During the Great War 1914-1919" ( Evans, Cobb & Sharpe, Ltd, 1927) available online at http://nzetc.victoria.ac.nz/tm/scholarly/tei-WH1-Engi-t1-body-d2.html#name-130200-mention; Assorted records at Ancestry.com [November 2016]; "Distinguished Serice' in the New Zealand Herald 4 August 1915, "Wedding. Scrimshaw-Bain" in the Temuka Leader 27 April 1922, and "Hamilton borough council Election of 12 Councillors" in the New Zealand Herald, courtesy of Papers Past at https://paperspast.natlib.govt.nz/ [November 2016]; Hamilton CityCouncil cemtery records at http://www.hamilton.govt.nz/our-services/do-it-online/cemetery-search/Pages/default.aspx?surname=scrimshaw [November 2016]; SCroll web submission by C McKillop, 21 July 2018.